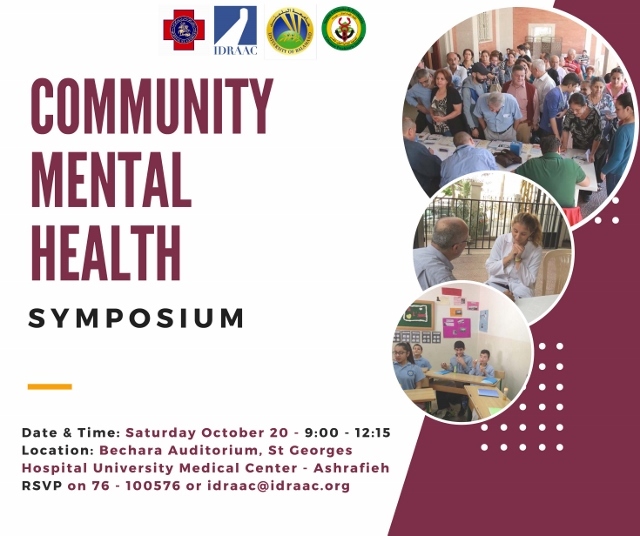 During the symposium, Dr. Elie Karam, psychiatrist and mental health researcher at the Department of Psychiatry and Clinical Psychology at the St. Georges Hospital University Medical Center and the Faculty of Medicine at the University of Balamand and President of IDRAAC presented a study conducted by IDRAAC on a number of Lebanese schools which hosted Syrian and Lebanese students and showed that "the effects of domestic violence are stronger on individuals than the effects of war". Professor Richard Mollica, Director of the Harvard Program in Refugee Trauma (HPRT) of Massachusetts General Hospital and Harvard Medical School and one of the leading international researchers in the field of mental health care of survivors of violence and trauma discussed the issue of the return of refugees to their home country. Professor Mollica presented the “Ghata” project for the Syrian refugees in Lebanon which he implemented with the Center for Civic Engagement and Community Service (CCECS) at the American University of Beirut in collaboration with the Harvard Program in Refugee Trauma. He noted that we need to have “a different way of thinking about refugees: we have to move away from the approach of food, water and shelter, to an approach that has to do with people being restored to wellness after being damaged by terrible violence and atrocities. So our approach needs to be a restoration approach, not only the basic needs” he said. He proposed a new “model in which we activate people from the time they distress to self-actualize themselves to go home, to have a job, to have a skill… since day one and not after years of displacement”. He also shared the result of “his studies on a sample of displaced children in Lebanon which "revealed that children were highly traumatized, having witnessed and experienced terrible violence and atrocities. Rates of PTSD and depression were over 50% and bullying and domestic violence were high”. He explained that the Ghata intervention has developed “10 portable school campuses located within refugees’ Informal Tented Settlements and serving around 5000 students annually”. In addition, the Center for Civic Engagement and Community Service partnered with the Harvard Program in Refugee Trauma (HPRT) for a “study in Lebanon on Syrian refugees to assess the frequency and impact of mental health problems and trauma outcomes (PTSD, Depression, Anxiety) on children aged 12-14 attending Ghata schools versus tented schools”.